Danny Cheng: "Logitech Revue or Sony TV? Both are my favorite devices maker~ great move Google :)"
Engadget: "Straight from Sony's Google TV unveiling in New York we finally know the official details of its plans, which include four HDTVs (24-, 32- , 40- and 46-inch) with prices from $599 to $1,399, plus a funky white set-top box with built-in Blu-ray player for $399. The 24-inch is a CCFL backlit LCD, while the larger models all feature edge LED lighting, while all of them feature built in WiFi, so no need to go stringing any new network cables to the living room. The only custom app we're seeing among the preinstalled ones (Netflix, CNBC, Napster, Pandora and more) is a Sony Qriocity VOD player, for more you'll be waiting for the Android Market to hit in early 2011. If you want to be the first on your block with one, hit up the local Sony Style outlet when they go on sale this weekend, or Best Buy stores starting October 24"
New Planet Discovered 2010 Called Gliese 581g: Can It Sustain Life? Danny Cheng: 'Gliese 581 is located 20 light years away from Earth? May be we need F-rocket~~"
Dots Period: "New Planet Discovered 2010: Gliese 581g aka Goldilocks Planet – Among the planets in our solar system, our planet Earth is the only one which can sustain life. Scientists have been exploring the universe for quite some time now in search for another planet which can support life. One of the most studied planet is the red planet known as Mars because of the possible presence of water. However, based on further research, the lack of a magnetosphere and its extremely thin atmosphere pose great challenge to life’s sustainability. A recent study conducted by a team of planet hunters from the University of California (UC) Santa Cruz, and the Carnegie Institution of Washington led to the discovery of a new planet using the W. M. Keck Observatory in Hawaii. 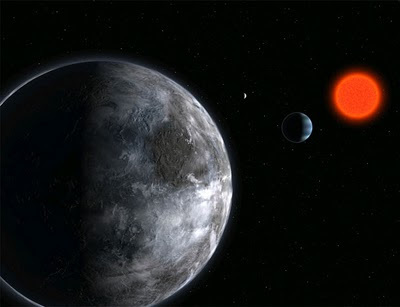 Accordingly, the new findings are based on 11 years of observations of the nearby red dwarf star Gliese 581. Gliese 581 is located 20 light years away from Earth in the constellation Libra. The new planet discovered is located in the Gliese 581 star system, in the so-called “Goldilocks zone” or an area where planets can can support liquid water on their surface. Hence the new planet discovered was named “Gliese 581g” or the “Goldilocks Planet”. Reportedly, this new planet has a mass of three to four times that of Earth and orbits its star in just under 37 days. There’s one more interesting fact about this newly discovered planet called Gliese 581g. Since it is tidally locked to the Gliese 581 dwarf star, one side of the planet is always facing the star and is in perpetual daylight, while the side facing away from the star is in perpetual darkness."